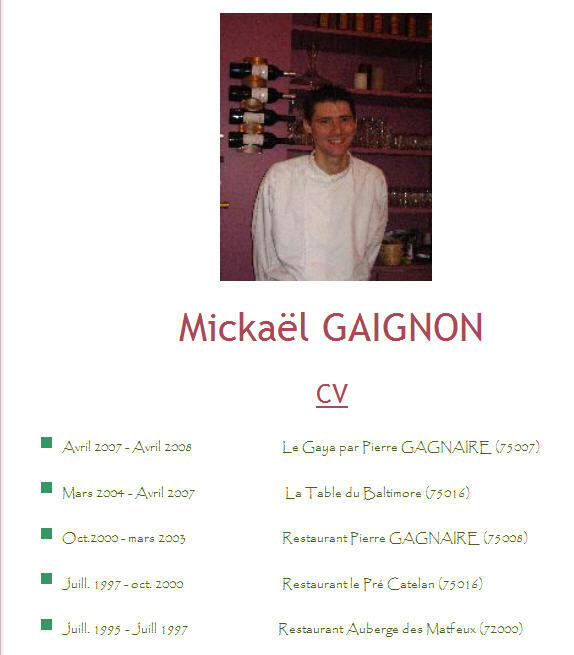 Le Gaigne, close enough to the French 'gagner' (to win) and 'gagnant' (winner) to project a boastful, winning facade even before one enters, but the name itself is reference to owner and chef with the strong pedigree and substantial CV, Mickael Gaignon. Am I detecting a pattern here? Small storefront restaurant just off the beaten path of a trendy quarter (I counted a mere 12 tables at Le Gaigne), run by a dynamic and young couple - he of culinary expertise manning the kitchen, she of efficient and amiable hosting and serving in the dining room, evidence of a creative flair in the dishes (sometimes a hit, sometimes a miss, but who's counting? ), fresh produce, unique ingredients, modestly priced menus and a decent price/quality rapport. If this reminds you of some of my previous reviews (see Fabrique 4, L'Agrume), then I rest my case. Co. and I reached Le Gagne, which sits on the edge of the Marais, following a leisurely stroll that commenced at the Forum Les Halles. Three or four blocks along rue Rambuteau, past Beaubourg (Pompidou Center), navigating around the hordes of tourists in the center of Paris on a mild Friday, August evening, past the little cheesecake shop that I fortunately espied for the first time (but certainly not the last), one reaches the tiny rue Pecquay and the now off-white restaurant Le Gaigne. Lucky enough to reserve on their last weekend before the restaurant joins everyone else on vacation until the end of August, I wasn't expecting much of a crowd during our meal, bearing in mind that a 'crowd' in Le Gagne would comprise about 20 patrons. And as it turned out, as we entered around 8:30 pm. we had our choice of all but one table, the one occupied by a sole woman contentedly already having begun her first course, working on an especially difficult New York Times crossword puzzle (I'm still only half done myself). 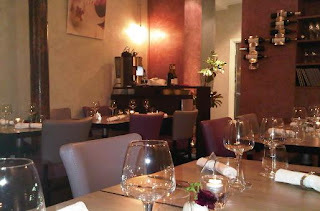 Well, it didn't take long for the restaurant to fill up, until only one tiny, lonely table remained unoccupied, it's intended diners having bailed without notice, much to the chagrin of the couples, sans reservation, who were turned away during the course of the evening. Le Gaigne's carte changes on the first of each month, but can be consulted online prior to one's visit (September's will appear on August 31). The relatively short August menu, a continuation of July's for obvious reasons (August only equals one week in this case) nonetheless posed more than one difficult choice dilemma, easily leading us to opt for the 5-course menu degustation. 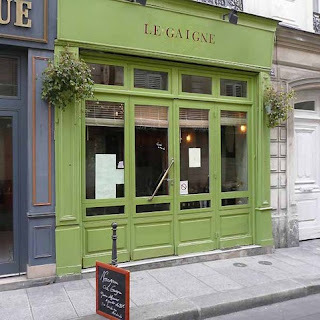 I guess I can gripe about the fact that Le Gaigne doesn't offer the standard menu for dinner (lunch offers a 17€ two-plate menu and 23€ three-plater), but the 42€ menu degustation is a great deal, and relatively speaking, the far better alternative to ala carte. 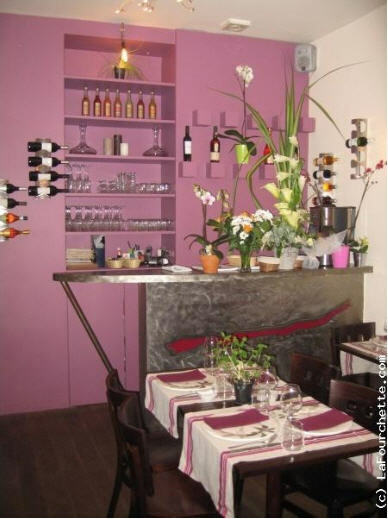 For an additional 17€, your dishes come accompanied by three glasses of wine (Sancerre 'Les Grands Champs' blanc, Cotes de Brouilly 'Les Muses', and a Muscat de Rivesaltes 'Chateau les Pins'). Never having understood the point of vin blanc, I went the traditional route and selected a Bourgogne Pinot Noir (29€) and was glad I did. Kalamata, a delicately prepared entree that was summer refreshing, with (if memory serves me correctly) pieces of cauliflower, green beans, and eggplant (see photo - the one I got without anyone looking). I don't think the payoff warranted the obvious amount of preparation that went into this dish, but it was a more than functional start. As is often the case with menu degustations, portions often are about mid-size what you can expect if you just order the damn dish off the carte, but happily, M. Gaignon didn't scimp here, but instead presented the full-size version. This was followed by a plate consisting of two croquettes de queue et pied de veau au curry, requettes et amandes fraiches, salade de sucrine et lange de veau (try saying that five times in a row as quickly as you can). Not a veal eater myself, I was granted permission to exchange dish 2 with one of the following from the ala carte menu: (a) Filets de sardine farcis d'une creme d'avocat a la brunoise de radis et concombre, artichaut poivrade marine, or (b) Poelee de champignons du moment, marmelade d'oignons de Trebons, omelette aux oeufs bio de la ferme de Champignolles. I was torn, and sans coin in my pocket, drum roll please, I chose (b). Bingo - this was a terrific dish, the taste growing in complexity as I delved deeper, the rectangular slab of omelette with onion marmelade topping providing a nice counterbalance to the mushrooms. A highlight. Moving on to stage 3, the fish dish, which consisted of a relatively small filet de daurade cuit au plat et brandade, coulis de persil, pommes-de-terre grenaille mitraille aux oignons nouveaus. I really appreciated the complements to the fish with crispy skin intact, a tasty mound of brandade and the accompanying dish of small rounded potatoes with persil and 'new' (whatever that means) tasty onions. 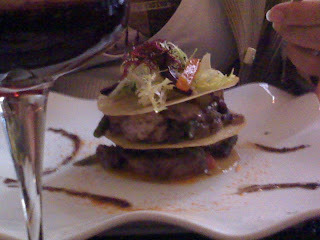 Dish four was perhaps the most inventive - Lapin en trois facons, aubergines grillees, poelee de courgettes. None of the three rabbit preparations looked anything like you would imagine a rabbit dish, and without attempting to describe them, please just take my word for it. Another hit. At this point in the festivities, one has the option to take a cheese detour with a nuage de camembert fermier, but it'll cost you an additional 3€ supplement (M. Gaignon, come on, why not just throw it in the deal?). I overheard the crossword woman really raving about this dish to a couple of guys at the next table, and if I had still been hungry, and a little less drunk, I would have sprung for it and been in a position to explain what the fuss was about. To finish up, for dessert we received a plate of peches pochees, parfait glace a la verveine, meringue et noisettes caramelisees. Call me strange, please, but I am not a big fan of peaches. Still, even beyond the half poached peach (try saying that . . ., oh forget it) there was enough about this rather original dish to keep it interesting, especially the minty verveine leaf and the caramelized nuts.